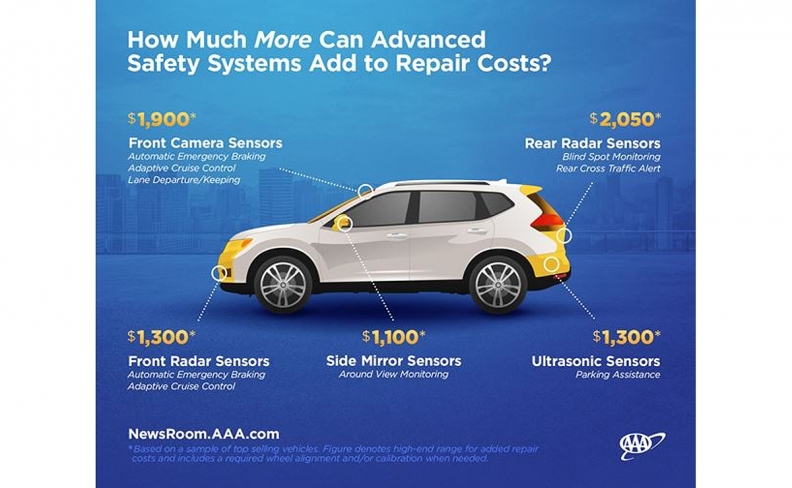 New advanced safety systems are slowly becoming more ubiquitous across the auto industry, but new research from AAA indicates that the benefits may come at a price even in minor incidents. A study conducted by the organization estimates that it can cost twice as much to fix these systems -- such as automatic emergency braking, lane departure warning and blind spot monitoring -- following a minor collision. Minor crashes can slap on up to $3,000 in extra repair costs, mainly driven by pricey sensors and recalibration needs, according to AAA. Factors such as sensor type and location, and vehicle make and model can sway repair cost values, AAA said. The study evaluated a 2018 Nissan Rogue, a 2018 Toyota Camry and a 2018 Ford F-150. A small front or rear collision involving a vehicle equipped with safety systems can reach as high as $5,300, the study revealed, more than double the costs for a car without advanced driver-assistance systems. The study found that typical repair costs for rear radar sensors used in conjunction with blind spot monitoring and rear cross traffic alert systems can range anywhere between $850 and $2,050, while costs for front radar sensors can run between $900 to $1,300. Meanwhile, repair costs for minor damage to front or rear ultrasonic sensors used with parking assist systems can range from $500 to $1,300, according to the study. Labor costs were determined based on data pulled from the National Auto Body Research and AAA Approved Auto Repair facilities. Costs for replacing windshields with a camera behind the glass can add up to three times more than a vehicle that isn't equipped with a similar camera, or $1,500, the study says. This is due in part by calibration requirements for the camera, and the need for factory glass to meet safety standards for "optical clarity," AAA said. "Advanced safety systems are much more common today, with many coming as standard equipment, even on base models," said Nancy Cain, spokeswoman for AAA Michigan, said in a statement. "It's critical that drivers understand what technology their vehicle has, how it performs and how much it could cost to repair should something happen."